In the 1950s and ‘60s, the green Gumby and his pal Pokey were TV fixtures as they joyfully lived the adventures kids dreamt of: going to the moon, jumping in and out of books’ fanciful tales, hanging out with people from far-off lands. Because he was a Claymation™ creation, he was eminently flexible and had a special knack for getting in to, out of, and through fantastic and often-danger-filled escapades. Gumby lives on in us. 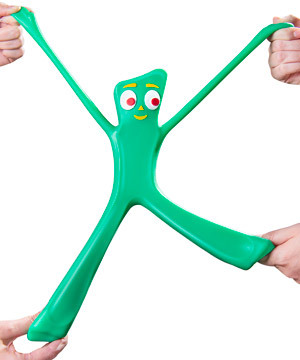 Gumby’s power is much more than flexibility. He is more than ever becoming key to success in whatever world you tool around in. The next time a colleague, friend or Aunt Bertha asks how you triumph in the face of unbelievable odds, tell them “Gumby.” If she runs off looking for the latest gadget codenamed for our little green hero, let her go. If on the other hand she asks what do you mean…? Snarky is so darn fashionable, as popular culture lauds Gawker and its cadre of follower blogs that pride themselves on carefully-crafted sarcasm and forever cynicism. He is confident, ambitious and willing to get the job done—that’s the scintilla of “real Gumby.” He is optimistic and focuses on solutions—not problems. You call it like it is … and then you are willing to get how others see it. Lazy is easy. Action is often strenuous and sometimes exhausting, but those who have Gumby (or saw him on TV) know that taking the effortless path rarely gets you where you need to be. Identifying nascent trends, for example, requires vigorous analysis of information from multiple sources, searching beyond your comfort zone. Ultimately, Gumby the flexible character was all about getting the job done—and well in a timely fashion—effectively using all tools available. Gone are the days when tasks came with a “when you can get to it” deadline. If you’re lucky enough to remember the office euphoria when IBM introduced Correcting Selectric then your head probably spins at the plethora of tools available to business folks in our day. These tools can help or hinder, and he is knowing how to use them to deliver results that measurably impact a bottom line, whatever your department. In each of his escapades, he learned from those around him. He sought information and explanation, and had fun doing it. Today, we’re bombarded by data from more sources than we can count, and those who embrace he invest the energy to constantly expand their wealth of knowledge. Those who have Gumby participate. They do not sit idly by and watch from the sidelines, these are those who jump in and use wit and intellect to get ANY job done. They overcome the most troublesome glitches and find innovative solutions. He isn’t yes-or-no; it’s how and why. In the military they say it best: Semper Gumby!